When kCura released Relativity Version Six earlier this month, I was skeptical of its improvements. Many times, new software releases include minor upgrades or backend tweaks that do not affect my day-to-day life. Boy did kCura prove me wrong on this one. Though a few of the upgrades were the usual “boring” tweaks, the addition of Pivot was enough to blow me away. Pivot is a new analysis tool that allows users to get an overview of their case in a visual format. Not only does it step up Relativity’s visual appeal, but it is also useful for gaining insight into your case. With Pivot, you can now evaluate your case in an entirely new way. 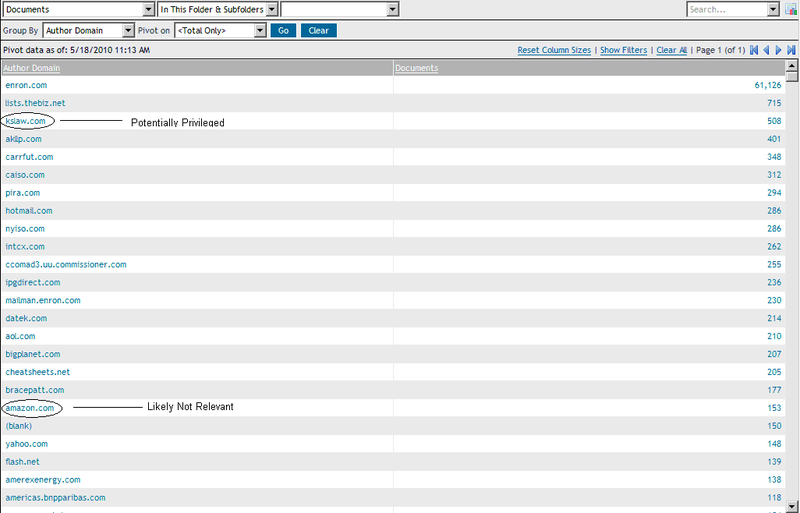 For example, you can analyze email domains, see the intersection between keywords by custodian and create timelines. This analysis is presented visually in lists, pie charts, line graphs or bar graphs. These graphs can be used for early case assessment, case strategy and review quality control. This is a huge improvement to Relativity allowing you to use this tool for more than just linear review and clustering. Thanks to the power of Pivot, Relativity can now be used as a culling tool before you start your review. If you are not using a separate ECA tool,you can rely on the Pivot feature to gain some similar ECA tool advantages. You can use the Pivot feature to view timelines of your case and assess the relevant dates as well as to cull out certain categories of documents. For example,in just a few minutes, and a few clicks of your mouse, you can segregate groups of documents and prioritize your review. Pivot allows you to obtain a list of the sender domains in your data. From this list, you can identify potential irrelevant domains and/or potentially privileged documents (see screen shot below). By clicking on the domain, you can see all the documents in the particular domain. For the potentially privileged documents, you can bulk batch them and send to your team for immediate privilege review. For the likely irrelevant domains, you can scroll through a sampling of the documents and when you are satisfied that the documents are not in fact relevant, you can bulk tag them as such and avoid the time and expense of reviewing junk mail. You can also use the line graph feature to give you an idea of what months and/or years to focus discovery on and identify any issues with your discovery to-date. 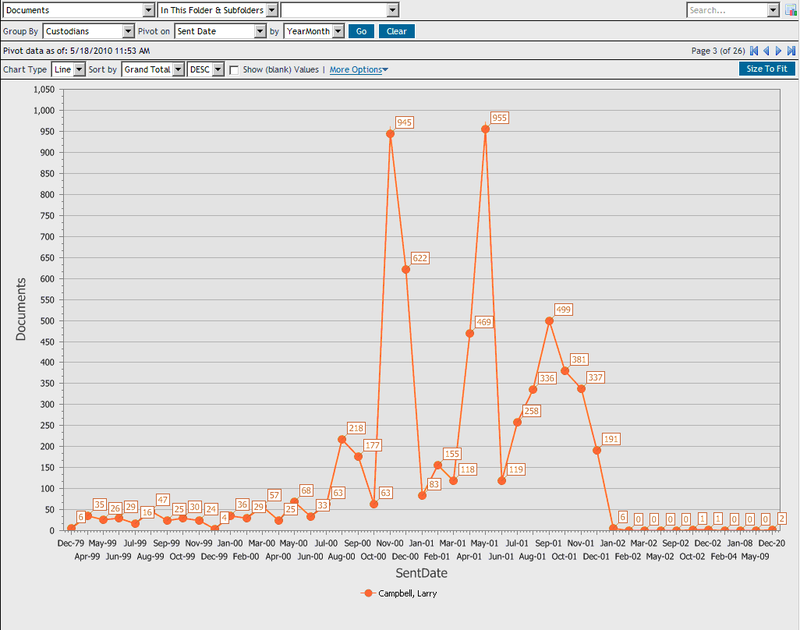 By creating a graph such as the one below, you can identify all the sent dates for your custodians. The graph below, created using data in a sales database, shows that the custodian Larry Campbell sent a large number of emails in November 2000 and May 2001. If these same peaks appear in other custodians, you may be able to focus your case around this period. This chart also helps you identify that there are some issues with the sent dates in your data—there should not be emails from 1979 and 2020. You can follow up on these data concerns early on in your case whereas without a timeline you may not have noticed this anomaly.